Battling acne is one of the biggest challenges people face. An unhealthy complexion affects confidence, self-image, and social interactions. Acne is not prejudiced; it affects everyone from the young teenager to the middle-age business professional. It is also very treatable. 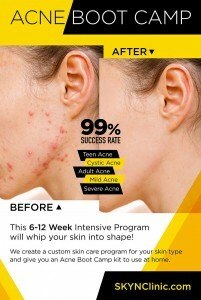 This 6 – 12 week intensive program will whip your skin into shape! In order to beat the war on acne, you need someone who has experience and knowledge in treating acne and has formed one of the best acne treatments you can find. Our ACNE Specialists have advanced certifications in Acne Care, and have also experienced the same condition and emotions you are experiencing. At SKYN Clinic & Apothecary’s Acne Clinic, a holistic approach is used to treat acne. We treat your acne with innovative technology and results driven, natural products. Your home care product kit is Custom Formulated just for you! Because of the treatments, your home-care products will be able to penetrate the pores easily, allowing your skin to be more receptive to your home-care regimen, and prevent new breakouts. Managing acne is like finishing an obstacle course. It’s a challenge, it can be exhausting, but clear skin is your reward! Your ACNE BOOT CAMP coach will be by your side through every intense and LIFE CHANGING moment. Your coach is there to provide professional guidance and support 24/7. We’ll be cheering you across the finish line. This is a real program for real people! 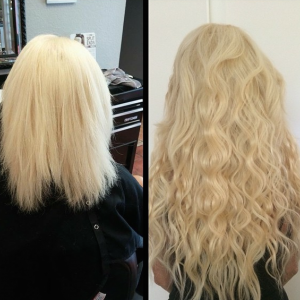 Our clients are your classmates, coworkers, next door neighbors, and friends! This program has a 99% clear rate and a 100% rate in confidence boosting. Your products: This camp comes with home care products. Without your products, your success rate is 0%. Our Clear Skin System is custom blended just for your type of acne and skin, with high quality, state-of-the-art ingredients guaranteed to clear acne-prone skin. Your program: The program consists of a clinical combination of acne treatments, LED light therapy, mild skin peels, oxygen treatments, and state-of-the-art acne skincare products for your home care regimen. Consultation: At the consultation, you will fill out the needed paperwork to receive the correct treatments. A skin analysis and patch test is done to determine your skin type, grade of acne, and skin sensitivity. The meidcdal esthetician will also discuss and go over your needs and concerns. An over-haul of all your skin care products and make-up will be done. If this appointment is scheduled with your first treatment, the consultation fee will be waived. The LED Blue Light, therapeutic light kills acne bacteria, reduces inflammation and speeds up healing. Deep pore cleansing, enzyme exfoliation, steam and extractions, and oxygen infusion are included. Healing antioxidant nutrients are infused with a detoxifying Oxygen Blast followed by the LED Blue Light Therapy. Our Cucumber Cooler astringent and Aloe & Azulene Masque soothes, calms, and balances the skin. The benefits: Eliminates bacteria from the skin, decreases the inflammation associated with red pimples (papules) seen in acne. After a number of treatments, the blemishes disappear and skin regains its normal appearance. Microdermabrasion used for acne, helps to open up and de-clog your pores, resurfaces and exfoliates the skin, while forcing the skin to produce new collagen, which helps to reduce acne scars and marks. 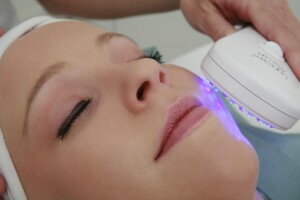 Blue LED Light Therapy helps kill bacteria and calm the skin after extractions.